You don’t always have to set the highest resolution for your images in Android’s Camera app, especially when you’re shooting for the web or uploading pictures to Facebook, where you really won’t want the subjects to be completely recognizable. Such low-resolution images have saved many a political career. As with other features, not every version of the Camera app follows the same set of directions for setting image resolution. You might find an icon directly on the touchscreen or on a menu displayed by touching the Control icon, the Action Overflow icon, or a Menu icon. An arch of additional icons appears, as shown, left. Choosing the More Options icon. It’s the middle icon. Touch it to see a new set of icons, as shown, middle. Touch the Picture Size icon. The icons disappear and the Picture Size menu appears. Of the resolutions shown, QVGA is the lowest, and VGA is the second lowest. The highest resolution is 8M pixels, or 8 megapixels. Video recording uses image quality settings, not resolution. To set the image quality for videos, switch the Camera app to video mode. 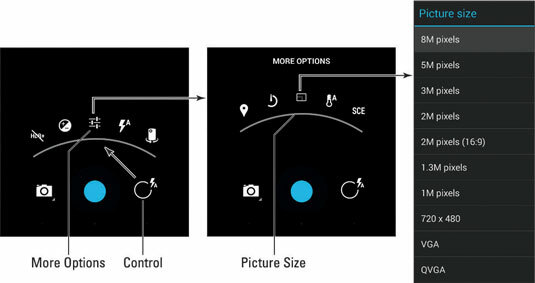 Then follow the same initial steps you used for setting single-shot resolution. In the stock Android Camera app, you take these steps: Touch the Control icon, touch the Settings icon, and then choose the Video Quality command. Select an item from the onscreen menu. As with setting single-shot resolution, the highest video quality isn’t always required. For example, if you’re shooting a video that you plan on uploading to the Internet, select one of the lower if not the lowest quality. Resolution and video quality for the front-facing camera are set by switching to the front camera and then following the same steps. The resolution and quality choices are more limited, however, because the front-facing camera is not as sophisticated as the rear camera. Set the resolution or video quality before you shoot! Especially when you know where the video will end up (on the Internet, on a TV, or in an e-mail), it helps to set the quality first. Megapixel is a measurement of the amount of information stored in an image. A megapixel is approximately 1 million pixels, or individual dots that compose an image. It’s often abbreviated MP.